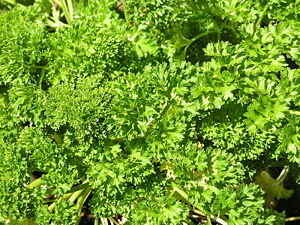 Parsley (Petroselinum crispum), a biennial herb, has bright green leaves often used used as an herb and a garnish. It is the primary ingredient in "tabouleh". There are two main types commonly used as a herb: curly leaf and Italian (or flat) leaf parsley. A third type of parsley is grown for its roots, which are used as a vegetable. These roots are often used in Central and Eastern European soups or stews. To grow parsley one needs a deep pot in order to accommodate the long taproot. If grown indoors at least five hours of sunlight a day is required. Parsley owes its distinctive flavor to apiol, a dimethoxy-methylenedioxy-allylbenzene. Apiol has been used in the illicit production of designer drugs. Small doses have also been used in treating menstration disorders; however, large doses are toxic and may cause liver and kidney damage. Old wives' tales and herbalists tout parsley as an aid to abortion, but this link is tenuous.